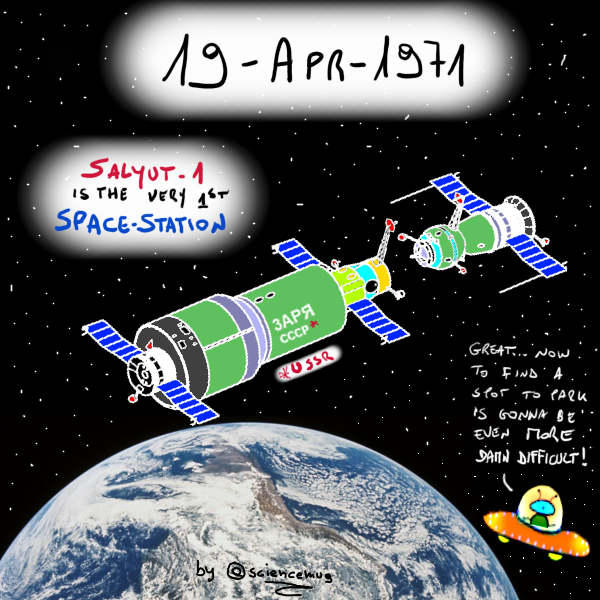 sciencemug sip science & laugh: 19 APRIL 1971: MEET SALYUT-1, THE FIRST SPACE STATION! 19 APRIL 1971: MEET SALYUT-1, THE FIRST SPACE STATION! This day (14 April) of 1971, the former Soviet Union (aka USSR aka CCCP) shoots into the sky a 20meter long, 4meter wide metal beast of more than 18 tons: the Salyut-1. That’s the veeery first space station ever. The Salyut-1 has three pressurized compartments for the crew. One of these chambers, the 7th of June, connects with the Soyuz 11 space ship which brings in the humans (aaand the space party begins). Then the crew goes back to the docked Soyuz 11, and gets back on Earth (suffering anyway of probably some kind of space hangover). As for our dear space station, well, after 175 days in orbit (11th of October) it is made to plummet into the Pacific Ocean. Farewell, Salyut-1, the veeery first space station ever.